The Draconids represents the first time a comet was discovered before its meteor shower. When are the Draconids visible? The Draconid Meteor Shower is the byproduct of Comet Giacobini-Zinner (21P/Giacobini-Zinner), a Jupiter-Family Comet that only takes 6.6 years to orbit the Sun. The comet was discovered by Michel Giacobini on December 20, 1900. Since the relationship between comets and meteor showers was discovered only decades prior, several astronomers speculated if Comet Giacobini-Zinner was capable of producing a meteor shower. In 1915, M. Davidson examined several comets dating back to 1892, and speculated that 21P/Giacobini-Zinner would produce a meteor shower around October 10, 1915. He revised his prediction in 1920, and observed five meteors radiating from Draco between October 6 and 9. Since Comet Giacobini-Zinner can pass near Earth orbit in early October, its meteor showers can be intense. 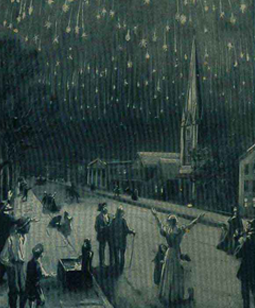 In 1933 and 1946, the Draconids produced thousands of meteors an hour. These two meteor storms were among the most impressive in the 20th century, rivaling the great Leonid Meteor Storm of 1966. On October 8, 2011 the Draconid Meteor Shower produced an impressive 1000 meteors per hour. In the years that followed it was less intense. That's what makes the Draconids so interesting; it is nearly unpredictable. Will the Dragon awake this year? Get away from the city on October 7 and 8 this year, and look toward Draco after the sun sets in order to find out. The vast majority of meteor showers are named after the star, or constellation, from which they appear to radiate. The same can be said for the Draconids, which radiate from Draco, in early October. However, they are also known as the Giacobinids in honor of the important role this particular comet played in astronomers being able to connect specifIc comets to specific meteor showers. Each year, the Draconids peak on October 7 or 8. Since Draco is a constellation near the north star, the Draconids are best viewed in the northern hemisphere (US, Canada, Europe and Northern Asia). NASA has sponsored Cameras for Allsky Meteor Surveillance (CMAS), a network of low-light cameras to verify over 300 meteor showers among the International Astronomical Union's (IAU) Working List of Meteor Showers that remain unverified. One, the February Eta Draconids - a.k.a. #427 on the IAU list - were first observed in 2007. They were confirmed on February 4, 2011, when a group of five entered Earth's atmosphere near the star eta Draconis. The orbit of these five meteors doesn't match any known comet. It may be an undiscovered comet with an orbital period of hundreds or thousands of years. It obviously has an orbit that crosses Earth orbit, so it's important for astronomers to identify this potentially dangerous comet as soon as possible.